– Are you frustrated by the clasps that are commercially available to us for our jewellery designs? Nothing lets your work down more gracelessly than the ugly and fiddle-some lobster catch! So, for this term’s course we are going old school as we explore how to design and make our own clasps for necklaces. Whether you favour box clasps, toggles or bayonets, the focus here is on making a visually integrated clasp that adds a beautiful element to your jewellery design while also providing secure attachment. How can we take advantage of gravitational forces to produce effective joining mechanisms? What can we do to ensure elements fit together securely? How do toggles, box clasps and bayonets work? Our first exploratory project aims to develop your technical skills while also encouraging experimentation and design development. 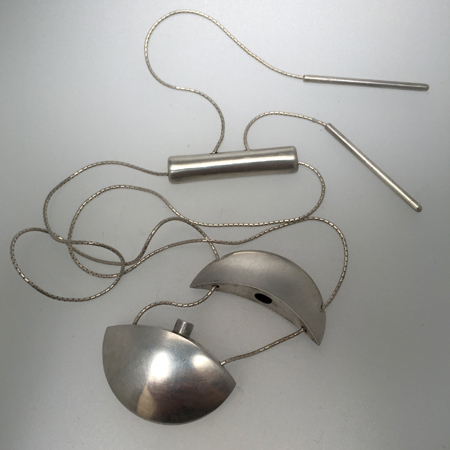 The second project requires that you put your design and technical skills together to make a necklace having an integrated, functioning clasp. You’ll have sketchbook pages bursting with ideas that explore shape and functionality, and a box full of quick tests in card and metal sheet. You will also have made at least 2 well-executed sample clasps that have complex functionality, eg box claps, bayonet clasps, screw-thread attachments, keyhole clasps. Your final piece will be a necklace with a beautifully integrated clasp, that will convince you never to by a lobster catch ever again!